Groningen’s shopping scene is decidedly ‘green’. 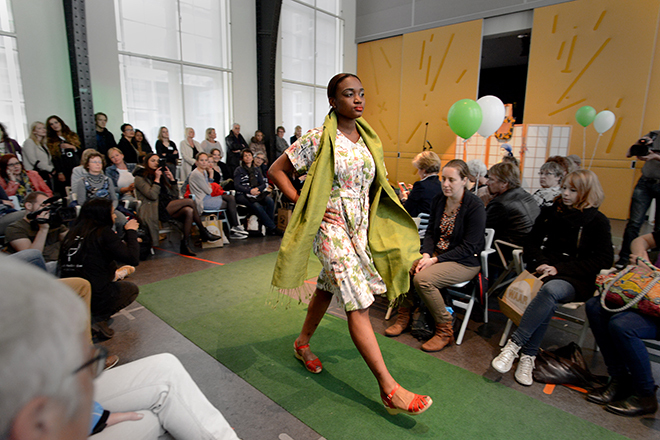 With events like Fair Fashion Festival and multiple vintage kilo sales throughout the year, it seems that sustainability and fashion are the talk of the town. But how manageable is it for students on a budget to shop conscientiously? Sustainable clothing initiatives from flea markets to wardrobe swapping have become a common sight in Groningen, catering to students in particular. A resurgence in the popularity of vintage clothing is connected to the eco fashion movement. ‘Secondhand clothing is also a form of sustainable and fair fashion’, says Simone Wielinga, co-founder of Groningen vintage store Stardust. The sense of community that shoppers experience when buying clothing from non-mainstream stores is also important, as well as the knowledge that the clothing they are buying has a backstory when they purchase secondhand items. While chain stores such as Primark and H&M are famous for affordable prices, in a shopping experiment, we learned that shoppers can get even more clothing for less money at vintage kilo sales. Finding clothing that is both sustainable and fashionable is fast becoming the new way to shop for many students in Groningen. From events like Fair Fashion Festival, Vintage Kilo Sale and O-SWAP to community closet spots and thrift shops such as DarpDecade and Stardust, Groningen hosts dozens of opportunities for the environmentally and ethically aware shopper to fill out their wardrobe. The social and emotional aspects of sustainable shopping really matter to students in choosing where to buy their clothes. Visiting VinoKilo for the second time, Julia Danu, a RUG master’s student in language and cognition, considers ‘green’ shopping the new norm. It is overcast during the sale on Saturday, but palm trees, loud music, a wine bar and colourful food trucks transform the remotely located Paradigm into a bohemian enclave. ‘VinoKilo is in a way a community event’, says Robin Balser, founder and CEO of DarpDecade and Vintage Kilo Sale. Balser ambitiously describes sustainable fashion as ‘everything that offers an alternative to mainstream consumption, from clothes to ideas, methods, and organisations’. Mainstream shopping is increasingly characterised by ‘fast fashion’, but the fashion industry’s urge to keep pace with quickly changing trends and nearly instantaneous consumption through rapid manufacturing and cheap prices (think shops like H&M, ZARA, and Primark – see box ‘The shopping experiment’) is beginning to be challenged by new – slower – ways of shopping. Sustainable fashion, also known as eco fashion, is a part of the growing trend and philosophy of making more environmentally-friendly choices in order to reduce human impact on the planet and create a sense of community and social responsibility. Is it really possible to find sustainable clothing options that are competitively priced? With the grand opening of Primark* in Groningen last week, the UK decided to find out: we conducted a shopping experiment. Nina headed to Primark and VinoKilo with 50 euros in hand to spend at each location and the goal of buying as many items as possible. Despite Primark’s central location and its offerings of new and trendy clothing made (mostly) of natural materials, the shopping experience was fast and there was a distinct lack of any sense of community. At Primark, Nina paid 45 euros for six items, including a pair of platform sandals and a t-shirt with a Star Wars print. Although it took her 40 minutes to reach VinoKilo at Paradigm by bike, it was more of a chilled out shopping experience that actually yielded more items, all of which have a story. She spent the day listening to music, drinking beer and talking to friends, in addition to the actual shopping: 10 items for 49 euros. 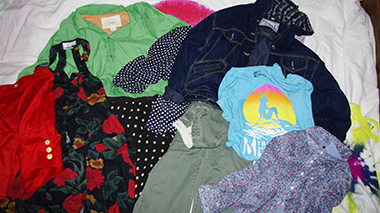 The highlights: an oversized jean jacket, a polka dotted summer dress and a crop top with The Little Mermaid print. 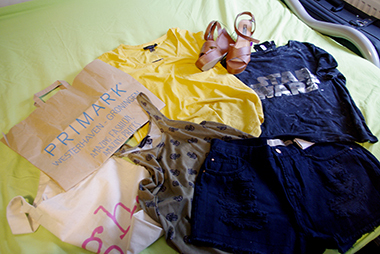 *The 50 euros for Primark and VinoKilo were provided by the UK. Clothes swapping follows those principles as well. Tjitske Kingma, a former English student at the RUG and current marketing and promotion coordinator at Usva, says that raising awareness among students about sustainable fashion is the driving force behind O-Swap, which started in 2014 as a collaboration between Usva and the RUG’s Green Office. This year, DuCie is also joining in on the event, whose fourth edition will take place on Friday, 27 May. ‘Many people just keep on buying clothes and they aren’t aware of the implications for our environment and the circumstances the people who make our clothes live in’, Kingma says. With second-hand shops, clothing swapping events and businesses that sell organic wares popping up around town, Groningers have ever more opportunities to live a sustainable lifestyle. That goes for students too, naturally, and Kingma believes that it is exposure to more information via traditional and social media that is prompting young people to change their ways.